Dissolve sugar and gelatin in water over low heat. Remove from stove; stir in sour creme and vanilla until smooth. Chill the mixture until slightly thickened (like unbeaten egg whites). Fold in whipped creme with wire whisk until well blended. Pour into greased (I use Pam) 6 cup ring mold (I use a bunt pant and it works well). Chill until set. Mix cornstarch and sugar, add berries and cool until thickened. Cool. To un-mold creme, take a spatula and run along the side, then turn onto serving platter. if you have trouble getting it out, run some hot water over the mold and it should slide right out. Serve topping in small bowl in center of ring if using a ring mold. -This is the most wonderful dessert! Cream margarine, vanilla and sugar well; beat in eggs. Sift together flour, baking powder and salt; beat in alternately with milk. Pour into a 9 inch round pan. Bake at 350 degrees for 30 minutes, or until done. Cool 10 minutes; remove from pan. Mix sugar, flour and salt; stir in milk. Bring to boil, stirring; cook 2 minutes longer. Remove from heat. Slowly stir 1/4 cup of the hot mixture into 1 beaten egg; return to pan; heat just to boiling. Stir in margarine and vanilla. cover and chill. Melt margarine and unsweetened chocolate. Stir in powdered sugar and boiling water until smooth. Use immediately. Split cake into two layers; fill with cream filling and spread chocolate glaze on top. Keep refrigerated. Soak bread in milk until soft. Heat over medium high heat until nearly boiling. Beat eggs until light, add sugar, salt and vanilla to eggs. When well mixed, stir into bread and milk mixture. Pour into a 1 1/2 quart baking dish, set in a pan of hot water and bake at 325 degrees about 1 hour or until done. In a large bowl, combine flour, sugar, baking powder, baking soda, salt and spices. Stir in remaining ingredients until dry ingredients are moistened. Fill large sauce pan or electric skillet 2/3 full with oil. Heat to 375 degrees. On well floured board knead dough 1 to 2 minutes or until dough is no longer sticky. Roll half the dough to 1/2 inch thickness. Cut with floured doughnut cutter. Slip doughnuts into hot oil, frying 1 to 1 1/2 minutes per side or until golden brown. Drain on paper towels. Shake doughnuts in paper brown bag with sugar, cinnamon and sugar or powder sugar as desired. ~For Halloween doughnuts I frost with orange and chocolate butter frostings. Heat both chips in a microwaveable bowl in the microwave. Heat in 30 second cycles and stir in between each one until chips are all melted. Spread 1/2 of the mixture in a 9x13 inch greased or foil-lined pan. Let stand until firm. Heat and stir sugar, margarine and milk in heavy medium saucepan on medium heat until boiling. Boil for 5 minutes stirring often. Spread evenly over chip layer. Sprinkle first 1/4 cup peanuts over top. Heat peanut butter in microwave until melted. Add marshmallow creme and vanilla. Stir until smooth. Spoon mixture in dabs, using a tsp. for each dollop, over peanuts. Sprinkle second 3/4 cup peanuts over top. Heat and stir caramels and water in microwavable bowl. Heat until smooth. Spread over peanuts. Reheat remaining 1/2 chip mixture if necessary until spreading consistency. Spread evenly over caramel layer. Chill until firm. Cut into squares. 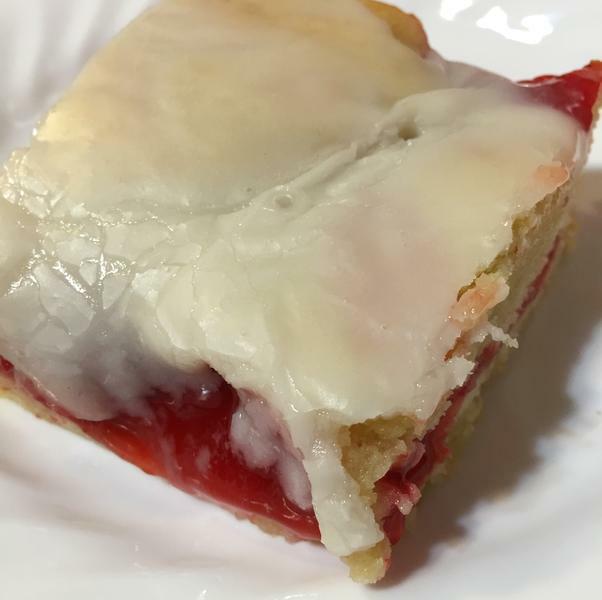 ~ These are yummy but very rich and I recommend cutting them into small squares. Mix margarine, sugar, eggs and vanilla together. Add flour, baking powder and salt. Pat half the dough mix in greased 9x13" pan, spread can of pie filling over this. Pat rest of dough on top. Bake at 350 degrees for 40 minutes. While warm frost with glaze made from powdered sugar, milk, margarine and vanilla. Melt together chocolate and margarine in a heavy 2 quart sauce pan over low heat. Gradually stir in boiling water. Continue cooking over medium heat, stirring constantly until mixture boils. Stir in sugar and corn syrup. Bring to a boil, stirring constantly. Remove from heat. Cool 5 minutes. Stir in salt and vanilla. Serve warm or cold. If it gets sugary just reheat in microwave. In a large mixer bowl combine 2 cups flour and yeast. Heat milk, sugar, margarine and salt until warm (115-120 degrees). I do this in the microwave. Add to dry mixture; add eggs. Beat at low speed with mixer for 1/2 minute, scraping bowl. Beat 3 minutes at high speed. Stir in enough flour to make a moderately stiff dough. Knead until smooth 8 to 10 minutes. Place in greased bowl, turning once (to coat other side). Cover; let rise until doubled. Punch down, cover, let rest 10 minutes. After dough has rested for the 10 minutes pinch off walnut size pieces and roll out between your palms- 3 to 4 inches long, to make the 24 or 48 rolls. While they are resting, melt 1/2 cup margarine over low heat and mix the 2 1/2 cups sugar with the desired amount of cinnamon, about 1-2 tbsp. Mix well. Roll dough in melted butter, then roll in cinnamon- sugar mixture; tie in a knot and place in 9x 13 buttered pan. When done sprinkle remainder of sugar over top, as well as melted butter. Drizzle white corn syrup (Karo) over top, cover and let rise until doubled. Bake at 375 degrees for about 15-20 minutes. Invert on cooling rack to cool. ~I make this ever year for Christmas morning breakfast. It's a favorite that has been in my husbands family for many years. Cream the shortening until light. Add the salt, flavoring and egg whites. Beating well after each addition. Then add the powder sugar gradually, blending well after each addition. Continue until frosting reaches the right consistency. If too thick then add some milk. You want it to be light a fluffy but not floppy. ~This is my favorite frosting to use with decorating tips. Add all ingredients to a double boiler and cook over rapidly boiling water. Beat with a mixer until frosting reaches stiff peaks. It takes about 7 minutes. Let cool then frost your cake. Double Boiler (purchase at Sur La Table) This one is just like the one I use. Line cupcake pan with cupcake liners. Place 1 vanilla wafer in each cup. Mix cream cheese, vanilla and sugar on med speed until well blended. Add eggs, mixing well. Pour over wafers, filling 3/4 full. Bake at 325 degrees for 25 minutes. - This is 1 of my husbands favorite cheesecake desserts and by far the easiest! Mix together flour and salt, set aside. Beat egg whites until frothy, then add vinegar. Continue beating until egg whites are stiff or just until spoon can be turned over without whites slipping out. Add sugar gradually beating after each little bit. Beat egg yokes until thick, lemon colored. Add vanilla and beat again. Fold yokes into whites with a spatula, using long deep strokes and as few as possible. Sift in flour, folding it in gradually. Pour into buttered and floured 8x8" pans. Spread batter 1/2" thick. Bake in hot oven at 425 degrees for 8 minutes or until cake springs back when touched lightly with a finger. Let cool for a few minutes, then flip pan over a flat surface and cake should come out. Spread with your favorite jam, then carefully roll up. Slice 1" rolls. Caramelize sugar; pour into pie dish and swirl onto sides and all over bottom. It will harden very quickly, so spread it fast. Mix all other ingredients together in food processor; do not over whip or mix. Add liquid to dish and place over hot water bath. Bake at 350 degrees on middle rack for 60 minutes. Remove from oven and water bath; allow to cool then refrigerate. ~I made flan for the first time and it was wonderful! A very rich refreshing dessert. Combine margarine, sugar and vanilla in a large mixing bowl. Cream until light and fluffy. Add eggs; beat well. Combine flour, baking powder and salt; add alternately with milk, beating until smooth. Stir in mini chips. Pour into a greased and floured Bundt pan or a 10 inch tube pan. Bake at 350 degrees for 1 hour until done. Cool completely; remove from pan. Glaze. Bring sugar and 2 tbsp. water to boiling in small saucepan. Remove from heat and add mini chocolate chips; stir until melted. Blend in marshmallow cream; add hot water 1/2 tsp. at a time until desired consistency. Bake: 325 degrees for about 50 min. Cream butter, gradually adding sugar. Combine well on medium speed. Add eggs 1 at a time beating well after each addition. Add flour and cream alternately beginning and ending with flour. Add vanilla. Pour into any bunt pan and bake about 50 min. ~Make sure to spray the bunt pan with Pam. 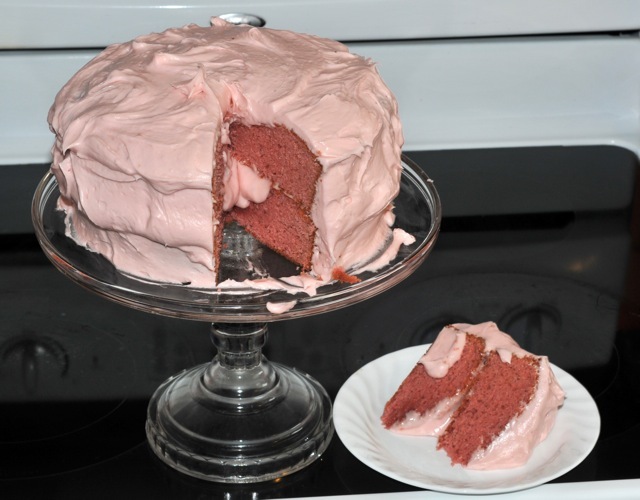 The story about this cake was my mother in law made it for the first time and under cooked it. So that left the center a bit gooey. It tasted a bit like cake batter. We all loved it. From that time on we always undercooked it and it became know as the ooey gooey cake. This is the cake I make every year for my birthday. So don't let it cook too long. It may not need 50 minutes depending on the bunt pan you use. The tooth pick you stick in the middle should come out a bit gooey. If you don't like gooey then cook away. It tastes like a wonderful pound cake. Bunt Pan (purchase at Chefs Catalog) This is the Bunt pan I use and really like for this recipe. In heavy 2-quart saucepan over low heat, heat chocolate, heavy cream and margarine, stirring frequently until melted and smooth. Remove saucepan from heat; then add liqueur. Refrigerate chocolate mixture about 2 1/2 hours or until very thick and of easy piping consistency, stirring occasionally as it's cooling in the frige. While chocolate is chilling prepare and bake tartlet shells. Cool on wire rack then fill with the chocolate. This is the most decadent orange chocolate recipe I've ever tried! Pie Crust - Only use 1/2 this recipe for this pie. Other 1/2 can be stored in refrigerator for about 1 week. Roll pie crust out and place in your pie pan. Combine sugar, corn syrup and melted margarine. Add egg that are alreadt beaten and pecans to syrup mixture, mixing throughly. Por filling into pie shell. Bake at 375 degrees for 40-45 minutes. Top should be nicely browned. Put the flour in a large bowl. Add salt and very cold water. (Makes the pastry more flakey) Cut the margarine into the flour, then use a pastry cutter to mix. When margarine is chopped up pretty well you can use your hands to finish mixing. Then divide into 2 piece and roll out for your pie pan. Rolling Pin (purchase at Sur La Table) I love the old fashion wooden rolling pins. Pastry Cutter (purchase at Sur La Table) This is my favorite style of pastry cutter. Heat oven to 350 degrees. Grease and flour 2 round pans or 13x9 pan. Prepare cake mix as directed on package, except substitute pineapple for the water. Stir shredded coconut and rum flavoring into the batter. Pour into pans. Bake as directed. Cool 10 minutes. Remove from pans and cool completely. Fill and frost with Cool Whip. Sprinkle with toasted coconut. Keep refrigerated. Heat oven to 350 degrees. Generously grease and lightly flour fluted tube pan or bread pan. In a large bowl, cream together sugar and butter until light and fluffy. Add vanilla and eggs one at a time, beating until well blended after each addition. Combine flour, baking powder, salt and orange peel; add alternately with sour cream, beating well after each addition. Pour into prepared pan. Bake at 350 degrees for 55-65 minutes. Cool completely. Dust with powder sugar. Wonderful served with mashed strawberries and whip cream. Mix sugar, salt, cinnamon, ginger and cloves in a small bowl. Beat eggs in a large bowl. Stir in pumpkin and sugar spice mixture. Gradually stir in evaporate milk. Bake in preheated 425 oven for 15 minutes. Reduce temperature to 350; bake 40-50 minutes or until a knife inserted into the center comes out clean. Cool on a wire rack for two hours. Serve immediately or refrigerate. 1 3/4 tsp. pumpkin pie spice can be substituted for the cinnamon, ginger and cloves, however the taste may be slightly different. In a large mixing bowl combine 1 1/2 cups of flour and the yeast. Heat milk, sugar, margarine and 1 tsp. salt until warm. 115-120 degrees; stir frequently until margarine almost melts. Add to dry mixture; add eggs. Beat with mixer on low speed for 1/2 min. Beat 3 minutes at high speed. Stir in enough of the remaining flour to make a moderately soft dough. Knead 5 to 8 min. either in a heavy duty mixer (I use KitchenAid) or by hand. Shape into ball, place in greased bowl, turn once. Let rise in warm place until doubled, 45 to 60 minutes. Punch down, divide in half. Roll to 1/2 inch thickness. Cut with floured doughnut cutter. Cover; let rise until very light, 30-45 minutes. Fry in deep hot oil. 375 degrees for about 1 min. per side or until golden brown. Drain on paper towels. Beat brown sugar and margarine. Beat in egg. Combine ingredients and add milk alternately with buttermilk. Stir in vanilla and rhubarb. Pour into greased 9-13 inch pan. Combine topping ingredients to make crumbs. Sprinkle on top of batter and bake at 350 degrees until toothpick inserted in center comes out clean, 20-30 minutes. For topping, in a medium bowl stir together flour, sugar, baking powder and cinnamon. Cut in butter or margarine till mixture resembles coarse crumbs. Set aside. For filling in a sauce pan combine rhubarb, sugar, cornstarch and water. Cook and stir until thickened and bubbly. Keep filling hot. In a small bowl stir together the egg and milk. Add to flour mixture, stirring just to moisten. Transfer filling to a 2 quart square baking dish. Using a spoon, immediately drop topping into small mounds atop filling. Bake cobbler in a 400 degree oven for 20 minutes or till a wooden toothpick inserted into topping comes out clean. If desired serve warm with ice cream. Mix the 1 1/4 cup sugar, 3 tbsp. flour and corn starch together. Put in a 13x9" baking pan. Then mix the oats, brown sugar, flour, melted margarine and cinnamon together and pour evenly on top. This is a wonderful summertime dish. Combine the warm water, sugar and yeast. Let the yeast proof and rise for 5-10 minutes. While the yeast is rising combine the hot milk (I heat this up in the microwave, be careful not to overflow), 1/2 cup melted butter or margarine, egg and salt. Whisk ingredients together until well blended. Add the yeast mixture to the egg mixture and mix throughly, then add the flour. Knead the dough for about 5 minutes or until well mixed and air bubbles are incorporated. Let rise until doubled in a greased bowl with a moist towel on top. When dough is risen take it and roll it out with a rolling pin on a floured surface. A large counter or table works well. Roll the dough out into a large rectangle. about 1/2" thickness. Take some soft margarine and rub it on the entire surface of the dough with your fingers. Then mix the brown sugar and cinnamon together and spread evenly over all the margarine. Sprinkle the raisins if you want them over the sugar mixture. Starting at the bottom of the dough, start rolling gently until you have rolled the complete rectangle and have a large tube. Take dental floss and slide under the roll. Bring both sides up together and then down opposite directions to cut the dough. (This is the best way to cut cinnamon rolls and not deform them.) Start cutting 1" rolls off the tube. When all have been cut place them in 9x13" baking pans. Bake at 350 degrees until lightly browned. You can then leave plain or frost with a simple white frosting. Take and melt the margarine. Add the vanilla and 1/4 cup milk. Then start adding the powder sugar. When it gets to thick add a couple more Tblsp. milk. If too thin just add a bit more powder sugar. Get to the consistency that you like, then spread on the cinnamon rolls. Take and melt the margarine. Add the vanilla and 1/4 cup milk. Then start adding the powder sugar. When it gets to thick add a couple more Tblsp. milk. If too thin just add a bit more powder sugar. Get to the consistency that you like. In a large bowl or mixer, cream together butter and sugars. Mix in eggs and vanilla followed by dry ingredients. Mix until smooth and no streaks or lumps remain. Lightly grease hands (I use the Pam spray again), press mixture into an even layer in prepared baking pan. 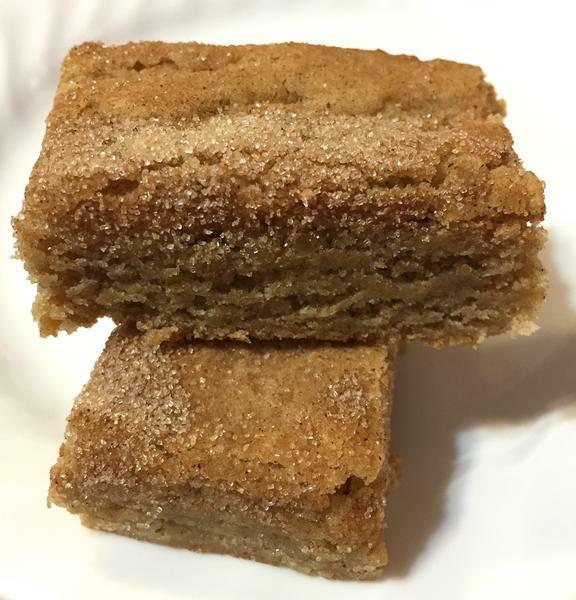 Sprinkle with cinnamon and sugar topping, then bake for 25-30 minuets until a tooth pick comes out clean. Let cool, then enjoy! In a large mixing bowl beat cream cheese and butter at medium-high speed with an electric mixer for 2-3 minutes or until smooth. Add strawberry preserves and vanilla, beating until well combined. Add powder sugar, beating until smooth. If too runny add more powder sugar, if too thick add a touch of milk. ~ This would be wonderful on white cup cakes among many other cakes. Line the bottom of 2 (9 or 8 inch) pans with parchment paper. Lightly coat each pan with Pam spray and set aside. In a large bowl, mix flour, baking powder, salt and baking soda together; set aside. In a large mixing bowl beat butter and sugar at med. speed with an electric mixer for about 4 minutes or until light and fluffy. Add preserves and then add eggs, one at a time, beating well after each addition. Scrape down sides of bowl and add vanilla and enough food coloring to achieve desired color. Reduce mixer speed to low and add flour mixture, alternately with buttermilk, ending with flour mixture. Divide batter equally with prepared pans and spread evenly. Bake on the middle rack of oven for 25-30 minutes, or until toothpick comes out clean. Let cool completely on a wire rack. Spread icing between layers and on top and sides of cake. Garnish with strawberries if desired. ~This was a wonderful cake! Heat oven to 425 degrees. Mix bisquick, milk, sugar and margarine until a soft dough forms. Drop by 6 spoonfuls onto cookie sheet. Bake for 10 to 12 minutes until golden brown. Split when warm. Cut strawberries into quarter sections, add 1/2 cup sugar and then smash with a potato smasher. 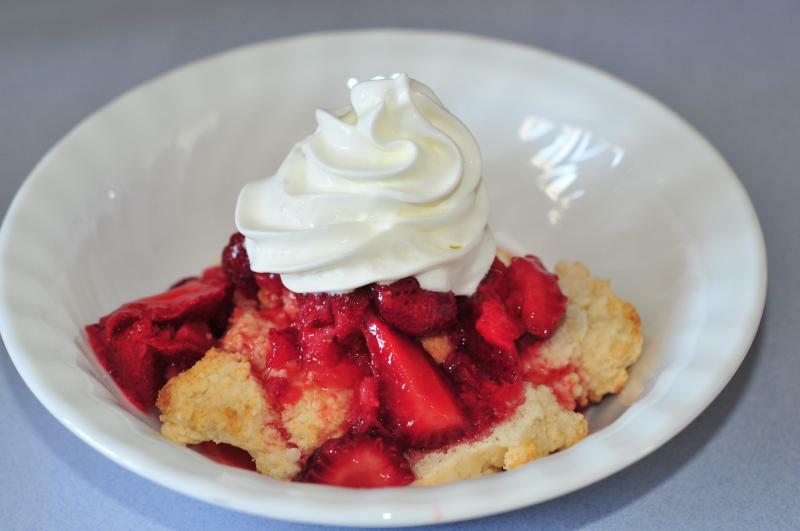 Spoon over shortcakes and top with whip cream. Bake at 375 degrees for 40-45 min. Combine filling ingredients, then put them into the pie crust. Mix melted butter and other topping ingredients, then sprinkle over the top of the pie. Bake for 40-45 min. until topping is golden brown. ~Two 29 oz. jars of canned peaches or 4 cups of frozen peaches (thawed and well drained) can be substituted for fresh peaches. Take the cherries and pit them, then add the sugar, cornstarch, and flour. Mix together thoroughly and set aside. Mix the crust ingredients together with a pastry cutter. When mixed throughly, take a piece of wax paper and place on counter top. Divide dough into two halves and place the first half on the wax paper, putting a second piece on top. Roll the dough out to fit a 9" pie pan. Take the piece of wax paper off the crust and put it face down into the pie pan, rolling the second piece of wax paper away as you go. Repeat for the top. Bake at 425° for 10min then 350° for 30-40mins. Take the powder sugar and water and mix until lumps are gone. should be a thickened consistency like egg yoke. Poor over pie as soon as it's out of the over. This is sooooo yummy! -My Aunt Debb taught me the glaze trick and I love it! Very good on Apple pies as well. In a large bowl, mix flour and salt. Cut in butter, then with a pastry cutter blend until mixture resembles coarse crumbs. Sprinkle in ice water, 1 tbsp. at a time, mixing lightly with a fork after each addition, until dough is just moist enough to hold together. Shape dough into 2 disks. Wrap each in plastic wrap and refrigerate for 30 minutes or overnight. Let stand at room temperature for 30 minutes before rolling. Roll each half of dough into 12 1-inch pieces. Press each piece of dough evenly into bottom and up sides of 24 mini muffin cups or mini tartlet pans. Prick each shell several times with a toothpick. Bake 15 minutes or until golden. Cool in pans on wire rack 5 minutes. Remove shells from pans and cool completely. -These can be easily frozen once completely cooled, then taken out and filled with your favorite filling. Blend together margarine, sugar and vanilla. Mix dry ingredients together. Add alternately with milk to the margarine, sugar and vanilla mixture. When it's well blended fold in the beaten egg whites with a spatula. Bake in 2 8" or a 9"x13" greased and floured pan. Bake at 350 degrees for 25 minutes. ~This cake is really good with Almond extract as the flavoring. Yummy Flavors (purchase at Chefs Catalog) More great flavors!